Some time this morning, if all goes as scheduled, a gang of 30 teenagers will board the Queen of Capilano ferry. The crossing from Horseshoe Bay in West Vancouver to Snug Cove on Bowen Island is just three nautical miles and lasts only 20 minutes. It will take the teens from one world to another. The teens count among themselves 10 Israelis, 10 Palestinians and 10 Canadians. They will spend the next weeks in close quarters, living together and working in teams to produce films, which they will script, perform, shoot, edit. But, first, they will talk and listen and rage and cry. Some have travelled from the deserts of the Middle East to the rain forests of British Columbia in search of peace. “This is about breaking the barriers, about getting them to trust each other,” said Reena Lazar, who shares with Adri Hamael the post of executive director of the Peace It Together Society. She is Jewish-Canadian. He is Palestinian-Canadian. She was born in Montreal, spent two summers as a youth in Israel, yet never learned the Palestinian narrative. Mr. Hamael was born in Jordan four years after his family were displaced from their home near Ramallah on the West Bank during the Six-Day War of 1967. Now, she teaches peace and conflict studies at Langara College. He is an entrepreneur. The Vancouver-based charity seeks to end the cycle of violence in the Middle East by bringing together future leaders. They are given a chance to make friends before feelings of distrust and intolerance become implacable. The young people are removed temporarily from the tinderbox of their homelands and placed in a peaceful setting in Canada in which their artistic goals can only be met through talking and co-operating. The hope is they will return home with new insights abut their historical enemies, as well as about themselves. The teenagers from the Middle East bring with them more baggage than what they carry in their backpacks and suitcases. Before they get down to making their films, the teens will take part in sessions directed by trained counsellors. They will talk about the Holocaust and the nakba, about security and humiliation, about soldiers and terrorism, about checkpoints and suicide bombers, about fear and hope. Needless to say, the sessions are intense. “We move through some very difficult emotions very quickly,” Ms. Lazar said. The setting and the shared quarters force the participants to accept one another. Instead of stewing in their hard feelings, the teens must address their anger. In 2006, I visited the charity's filmmaking camp, held that year on Galiano Island. At a café, a lovers' quarrel was being filmed by a three-person team. The directors were Inbar Sofri and Nadin Abu Dalu, both 17-year-old high-school seniors, one Jewish, the other Muslim. Both had long, curly black hair. They looked like sisters. They were paired with Ira Jordison, a lean teen from Vancouver. The lovers in the movie struggle with parental disapproval and with the frustrating intricacies of negotiating life in Israel and the West Bank. It ends with the boy turned away at a checkpoint and the girl collapsing in despair as she waits. The ending is deliberately – and brilliantly – ambiguous. Was it just a bad day, or the final act in an impossible romance? The campers returned home with a new outlook. Ms. Abu Dalu entered Bethlehem University to study business. Ms. Sofri is completing her military service. Though they lived only a few kilometres apart, the pair have met only once in the two years since their return. On Aug. 17, the films produced by this year's campers will premiere at a public screening at the Stanley Theatre in Vancouver. Vicki Gabereau will be the host. In the days to come, those 30 teens will have an unforgettable experience – travelling halfway across the globe to make friends with neighbours. Ben Swankey’s eyebrows are bushy like tumbleweeds. Even at rest, wispy white hair flows from his head as though he were facing a stiff prairie wind. His big hands and thick fingers are the legacy of his farming and labouring ancestors. In his own 94 summers, he has worked as a road builder, a bartender, a roofing inspector, an insurance salesman and as a labour journalist. Mostly, though, he was a writer and researcher. To the delight of his comrades and under the scrutiny of the police, he was a political organizer. Mr. Swankey recently self-published a memoir. He started it 35 years ago, but neglected to stop agitating for his causes — old-age pensions then, environmentalism now — and the project kept getting shelved. Now, he is hard of hearing and legally blind. The left side of his body has been limited by a stroke. He tackles physiotherapy as he once took on the bosses and vows to be out of his wheelchair by his 95th birthday in September. No one is betting against him. As it turns out, a recollection written for family includes cameos by the likes of the great American singer Paul Robeson and the Soviet cosmonaut Yuri Gagarin. He even met Norman Bethune, the Ontario-born doctor revered by Chinese Communists. Dr. Bethune has been dead for nearly seven decades. Like Mr. Swankey, all were Communists, a cause to which he devoted himself at age 18. A membership retained through the Nazi-Soviet non-aggression pact (1939), the revelations of Stalin’s crimes and the invasion of Hungary (1956), the crushing of Prague Spring (1968), the imposition of martial law against Poland’s Solidarity (1981) was finally ended by resignation in 1991. He came of age during the tumult of the Depression. It was the witnessing of a police attack on demonstrators that set his life’s course. He was born at Steinbach, Man., just months after his mother emigrated from Tsarist Russia. Two of his parent’s eight children died in infancy. The boy was aged three when the family moved to Herbert, Sask., where his father eventually found work as a labourer on a railroad crew. Most of their neighbours were Mennonites, who spoke Low German, understandable though difficult to master for the Schwanke (later Swankey) family, who spoke a more modern German at home. Inspired by adventure novels, especially tales about Tarzan, he formed a boy’s club called T.H.W.C., which stood for To Hell With Civilization. Later, after a political awakening, he would say the acronym should have stood for To Hell With Capitalism. His father was a strict man, a nationalist and admirer of Bismarck, not shy about using violence to enforce his will around the house. When Ben was 14, his mother fled with a daughter to begin a new life in Edmonton. At 14, the boy decided to ride the rails. He hopped a westbound freight, hanging out with hobos at a camp at Lethbridge, Alta. His first night in this province was spent asleep in a boxcar stationed at Yahk. At Wenatchee, Wash., he found work picking apples before returning to Saskatchewan to finish high school. By graduation, the Depression made unlikely any prospect of finding work. He and a friend decided to hitchhike around the world. They painted HERBERT, SASK. in block letters on their Boy Scout hats and hit the road. He learned about the mythical lake creature Ogopogo but was more impressed by the bounty of fruit to be found in the Okanagan. In Vancouver, he stayed with an older brother who tried to feed a wife and two children, one of them a newborn, on relief. The brother blamed Prime Minister R.B. Bennett for the economic calamity. Ben disagreed. He held the anti-Communist sentiments learned in his hometown. The brother took him to an anti-war demonstration near Victory Square, which was attacked by police after those in attendance began to parade without a permit. Men, women and even children fell under police clubs. The riot changed his life. He studied books in the library, became influenced by radicals. He moved to Edmonton soon after his 18th birthday after his mother sent him train fare. After joining the Young Communist League, he became an organizer, working with striking coal miners at Crow’s Nest Pass. He homesteaded near Prince George, B.C., where he became a member of the Communist Party. He eventually found work wielding a sledgehammer on the building of a highway between Banff and Jasper. The job paid 45 cents an hour and nearly cost him his life when a dynamite blast sent a rock hurtling in his direction. In Calgary, he helped organize support for the On-to-Ottawa trekkers, the striking relief camp workers led by Arthur (Slim) Evans. As a Communist, Mr. Swankey followed the party line — likely to cause whiplash in the terrible fall days of 1939. He favoured the British and Canadian war against Nazi Germany, then opposed the war when the party changed its stance on instruction from Moscow, which had joined the Germans in sacking Poland. In 1940, Canadian Communist leaders were rounded up and interned in prison camps for opposing the war. Mr. Swankey found himself sharing a hut with a dozen fascists at Kananaskis, Alta. He later was imprisoned at a camp at Petawawa, Ont. Soon after his release, Mr. Swankey enlisted in the Canadian Army. He ran for Parliament in the Alberta constituency of Jasper-Edson in the 1945 federal election, finishing last of five candidates behind the Social Credit incumbent. The next year he became the provincial leader of the Labour-Progressive Party, as the Communists had renamed themselves. To be a Communist in Alberta during the Cold War was as unwelcoming as it sounds. Mr. Swankey’s family lived in near-poverty. The Gouzenko revelations and the spy trial of Ethel and Julius Rosenberg in the United States also gave rise to the terrible possibility of punishment greater than imprisonment in an internment camp. Mr. Swankey’s daughter, now 63, remembers those days. As a girl, she had even written President Dwight Eisenhower asking him to spare the Rosenbergs for their sons. Her letter is one of several photographs and documents reprinted in “What’s New: Memoirs of a Socialist Idealist.” The book can be ordered from Trafford Publishing of Victoria. It is not Mr. Swankey’s first title. He wrote a biography of Slim Evans and is known as a prolific and popular pamphleteer. A biography of the Metis leader Gabriel Dumont, for which he could find no publisher in Canada, was published in 1980 in Moscow, in Russian. He says it sold 50,000 copies. Mr. Swankey, who lives at a care home in Burnaby, has the newspaper read to him everyday. He remains engaged and outraged. Five years ago, the city of Vancouver declared his 90th birthday to be Ben Swankey day. The city might want to start making plans for his 100th. The carpet is worn. The walls are covered by pegboard painted a garish red. Ancient wooden racks are stuffed with glossy magazines. The shop carries soda and sundries, smokes and sunflower seeds. An old wooden rack promoting Nielson's products is filled with jujubes and chocolate bars. A stack of TV Week rests beside the cash register, where handwritten signs warn of identity checks for tobacco purchases. Coins are placed on a rubber change mat promoting the Wall Street Journal. It dates from a time when the venerable business newspaper was not owned by Rupert Murdoch, who profits from so much sold here. Overhead, plastic letters spell out L-O-O-K and N-E-W-S-W-E-E-K. The signs must be at least 37 years old, for that's how long it has been since Look folded, a popular picture-magazine claimed by the popularity of television. As TV killed some magazines, so the Internet threatens the newsstand. In Vancouver, the Magpie Magazine Gallery on Commercial Drive shut its doors at the end of April. In Edmonton, a magazine shop called Front Page on Jasper Avenue has announced it will go to the giant remainder bin in the sky after Saturday's close. The proprietor of this Victoria shop is hanging in. So far. "We're a dying breed," Bob Streeter says. City Hall News is my kind of place. It is a welcome pit stop in the daily routine of many of its customers. Mr. Streeter was making a candy run to the wholesaler yesterday morning, so Dianne Sumner, a 15-year employee whose own reading choices include murder mysteries and gossip rags, watched the shop. Here's how one exchange went. "Good morning," a customer said as he reached for a package of gum before fishing for his wallet. He pulled out a twenty. She knew his brand without asking. Barbers and bartenders offer this kind of service, matching customer to desire with a comforting familiarity. She later confessed to being worried about one elderly customer known to come every Thursday to buy the latest issue of The New Yorker. He has not been seen for a month. Mr. Streeter and Ms. Sumner may not know the names of their patrons, but they do know what they like. The shop on Douglas Street is a throwback to a time when printed information moved only as fast as the mails. You can buy books of crossword puzzles that would make a simpleton feel like Einstein, and you can buy the latest issue of Le Monde, which would make a genius feel like a moron. Mr. Streeter is an amiable fellow quick with a quip. He arrives here before the 8 a.m. opening six days a week, retrieving bundles of newsprint to be placed on portable stands at the shop entrance. Sometimes, he is amazed to be still in business. If you were in Mr. Streeter's shoes, it might feel as though all levels of government were conspiring to get him to retire. In the 1990s, the province transferred offices from the downtown core to a new development along the Gorge Waterway. The move left the drug crowd more prominent on the sidewalk. Other clerical jobs were outsourced. When the next-door bank closed, the newsstand was forced to move across Cormorant Street to a space sandwiched between a furniture store and a tax-preparation business. The latest indignity is the health edict that no tobacco packaging be on display. Sheets of newsprint have been pinned above the cigarette racks. Some years ago, Chapters opened a giant store just down the street with an extensive selection of magazine titles. Mr. Streeter has operated this shop since buying it from his father around the time when the Beatles became a phenomenon in 1964. He is a pipefitter by trade, having apprenticed at the Yarrow Shipyards before working on pulp mills in Woodfibre, Gold River and Prince George. Camp life was not for him, though, and he has been moving magazines for nearly a half-century. The shop itself has been in the vicinity of city hall since about 1915. Mr. Streeter is proud of his stock. Year after year, he is voted the city's best newsstand in a poll conducted by the local chain of community newspapers. "You name the subject," he boasts, "and we have a magazine title." Hunting? Check. Hairdos? Check. Hotrods? Vroom. He carries Hot Rod and Haute Doll. He carries Opera News and Rolling Stone. He carries Ladybug and Ladies' Home Journal. He carries This England and This Magazine and This Old House. He carries National Geographic and Canadian Geographic and Africa Geographic. He carries True Detective and Foreign Affairs. He carries Forbes Investment and the International Socialist Review. He carries Metalsmith and Mental Floss. He carries Wine Spectator and Salmon & Steelhead Journal. He carries Bust and Adbusters. He carries Penthouse and House & Garden. He carries girlie mags and The Beaver: Canada's History Magazine. He carries Surfer's Path and Surfer's Journal. He carries Marie Claire and Donna Hay and Martha Stewart. He carries USA Today and the Guardian Weekly and Lapham's Quarterly. He carries O, W, WD, GQ, and OK! "You meet so many different and nice people," Mr. Streeter said. "That's what keeps me here. Every walk of life. We get 'em from the very bottom to the very top." W.A.C. Bennett has been a customer, as has been Ed Broadbent. Actors have unselfconsciously opened magazines to read about themselves at the till. They know when a local enterprise has been profiled in BCBusiness, as someone will have been dispatched to purchase a stack. Mr. Streeter clings to his shop in the hopes of the neighbourhood being rejuvenated when three surrounding condominium projects open their doors. He knows he carries what the people desire, whether pop or pop culture. In a previous location, the shop closed its doors as firefighters battled a fire in an upstairs room. Even as smouldering mattresses were being tossed on the sidewalk, customers banged on the locked door. They wanted their smokes. In movies, he portrayed the villain. On television, he was the heroic defence lawyer Perry Mason. A handsome actor with a penetrating gaze, Raymond Burr had a chiselled face and burly presence that made him a figure familiar to millions. He must have been a terrific actor to have made so popular a figure as unsympathetic as a lawyer. Mr. Burr lived the most fantastic life. Born to a family of humble circumstance in New Westminster, B.C., he grew up in China before becoming a teenage ranch hand in California. He lost his wife when her airplane was shot down by the Nazis, causing him to enlist in the U.S. Navy, with whom he fought the Japanese in the Pacific during the Second World War. His ensuing good luck in Hollywood was tempered by ill fortune in his personal life. A second wife died of cancer. As well, a son died of leukemia at the age of 10, but not before his father escorted him on a tour of America to see a land whose bounty he would not get to enjoy. All the details were dutifully recorded in obituaries when Mr. Burr died of cancer in 1993, aged 76. As it turns out, much of his tragic biography was fiction. Call it The Case of the Prevaricating Player. Or the Lying Lawyer. This much is true. He was born in New Westminster. On Friday, Canada Post unveiled a commemorative stamp honouring Mr. Burr. A modest ceremony was held in his hometown with the mayor presiding. 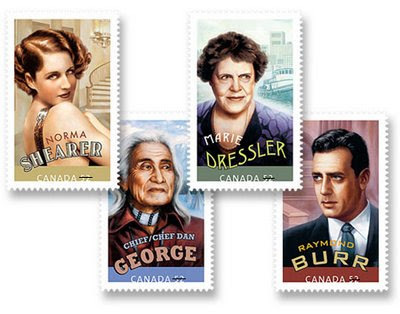 The Burr stamp, which portrays him in a courtroom, is one in a series of Canadians who became Hollywood stars. The handsome set, designed by John Belisle and illustrated by Kosta Tsetsekas of Signals Design Group in Vancouver, also portrays Marie Dressler, Norma Shearer, and Chief Dan George, the Tsleil-waututh leader born in North Vancouver. Mr. Benevides, 78, lives on an estate at Healdsburg, Calif. The rolling lands in Dry Creek Valley provide the grapes for Raymond Burr Vineyards. For 33 years, the two men were companions. They collected art and antiques, and became world renowned among horticulturists for their prize-winning hybrid orchids. (The million-dollar art collection was donated to a state university in California, while some 11,500 orchid plants were donated to Sonoma State University, which later renamed a botany building the Raymond Burr Greenhouse.) Mr. Benevides studied theatre at the University of California, Berkeley, winning a small role in the 1957 sci-fi thriller The Monster That Challenged the World. He had minor roles in several television series by the time he met Mr. Burr on the set of Perry Mason. Not only had Mr. Burr created a smokescreen with his tall tales about dead wives, but he was linked romantically in the gossip columns with a teenaged Natalie Wood. The two starred together in the 1956 noir drama A Cry in the Night, in which a creepy Mr. Burr kidnaps Ms. Wood. Though made famous by his television roles as Perry Mason and the wheelchair-bound detective Robert Ironside, Mr. Burr often played darker figures in his more than 90 screen appearances. He was the menacing brute whom James Stewart suspects of murder in Rear Window. He was a reporter in the American-release of Godzilla, King of the Monsters!, one of the odder of his screen roles. An indefatigable worker, Mr. Burr even delayed treatment of his cancer to complete filming of his last Perry Mason television movie (The Case of the Killer Kiss). In his obituaries, some references were made to Mr. Benevides as a business partner, fewer still to his being a companion. Many did not name him at all, though they included details about the imaginary wives. Did it bother Mr. Benevides not to have their relationship acknowledged in public? “That was no problem,” he said. He understood Mr. Burr could not tell the truth about his sexuality. The false stories about his background and his marriages may have been concocted to avoid investigation of his personal life, or they may have been exaggerations expressed before he became famous that could not later be recanted. Known as a philanthropist, Mr. Burr was active in many charities, including some in his birthplace. In turn, New Westminster celebrated their famous son, holding a Raymond Burr Day in 1988. When the old Columbia theatre was restored to its former glory, it was renamed the Raymond Burr Performing Arts Centre. Now, the post office is issuing 4.5 million portraits of the actor, cheap at 52 cents each. After the actor died, Mr. Benevides travelled to the Royal City, where he interred the ashes of his dear friend alongside those of his mother, who had died in 1974. The marker on the family plot at the Fraser Cemetery includes inscriptions for the actor's father, William, who died in 1985, and for his sister, Geraldine, who died in 2001. A man so adept at cajoling confessions in a make-believe courtroom couldn't tell the truth about himself. In his day, Bob Banks drew more illustrations seen by more British Columbians in more diverse places than any other artist. If you rode the bus, his cartoons graced the Buzzer bulletin. If you flew on CP Air, his artwork enlivened the placemat resting on every tray for every meal served. If you subscribed to Pacific Yachting magazine, his illustrations brought the sea to the printed page. If you read annual reports from the big forestry companies, you likely looked on the artistic renderings of Mr. Banks. If you were a student, his illustrations graced such textbooks as Captain of the Discovery: The Story of Captain George Vancouver. And if you lived in the province during the centennial celebrations of 1958, 1966, 1967 and 1971, you undoubtedly saw his rendition of a character named Century Sam. His creations became familiar – famous even, though he did not. At 85, the North Vancouver resident still draws daily, remaining part of the work force while his two sons enjoy retirement. From age 4, all he has wanted to do is draw. He grew up on East 6th Avenue in Vancouver, sandwiched between Victoria and Commercial Drives, where he remembered the streetcars had unforgiving wooden benches, unlike the padded seats to be found on the cars on the wealthier west wide of the city. Drawing and painting transport – cars, trucks, planes, ships – became a lifelong pursuit. The neighbourhood was popular with immigrants, the sons of whom would grow up to become judges and the like. Mr. Banks, a carpenter's son, would draw their portraits for the cover of The Advocate, the publication of the Law Society of British Columbia. Mr. Banks learned mechanical drafting at Vancouver Technical Secondary School, where his cartoons appeared in the 1939 yearbook. 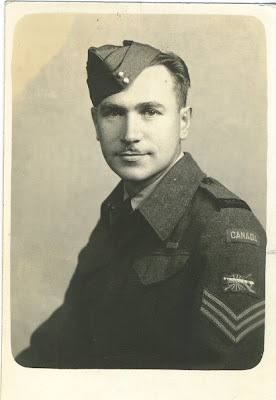 After two years at the University of British Columbia, Mr. Banks enlisted in the navy, soon after transferring to the Royal Canadian Air Force. The closest he got to being sent overseas was a posting to Newfoundland. He rose in rank to flight lieutenant. He trained as a bomb aimer, a position for which there were not many openings after the end of hostilities. He remained in the reserves, ready to serve as a desk jockey should the Cold War ever heat up. A stint at the Vancouver School of Art after demobilization gave him the formal training for what has been his livelihood for more than six decades. Because he could read blueprints, he got assignments to paint ships such as tugs and barges even while they were still being built in dry dock. In 1954, he approached the editor of The Buzzer about doing one-panel gag cartoons to enliven the transit publication. The newsletter, available aboard buses and streetcars, had been launched in 1916 to foster customer loyalty as B.C. Electric competed with private jitney operators. In 1956, two years before British Columbia was to celebrate the centennial of its founding as a Crown colony, Mr. Banks's best-known creation was unveiled. Century Sam was the brainstorm of Lawrie Wallace, the civil servant who would become known as Mr. B.C. Mr. Banks drew a pixie-like prospector in a tattered hat, checked red shirt and yellow vest, an image that appeared on coasters, brochures and felt pennants, as well as in newspaper promotions for the province and such private enterprises as Greyhound bus tours and Lucky Lager breweries. “He was a cute little geezer,” Mr. Banks said. To give the old feller some company, the artist later created Centennial Sue as a companion. Some actors also portrayed the character at centennial events. The best known was Sid Williams, whose memorable portrayal of the resilient miner was later honoured by the naming of Century Sam Lake outside Courtenay on Vancouver Island. 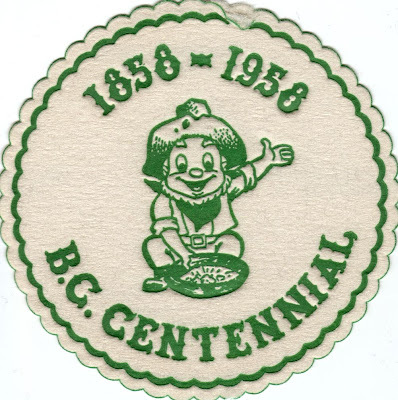 Century Sam was so successful he was revived for the centennial of the union of British Columbia with Vancouver Island (1966), for Canada's 100th birthday (1967) and for the centennial of the province's joining of Confederation (1971). The artist thinks of his creation as being a distant ancestor of the 2010 Olympic mascots Miga, Sumi and Quatchi. Mr. Banks has a story he likes to share. He and his wife were visiting the Bayshore Hotel some time in the early 1970s when he spotted a tall, lean man with wavy hair drinking a cup of coffee. He was surprised to see Norman Rockwell in town. The prolific artist, whose covers for the Saturday Evening Post won him mass popularity, was joined by his third wife, Molly, with whom he was about to embark on a cruise to Alaska. Mr. Banks invited the couple to join him on a driving tour of nearby Stanley Park. The quartet were in the hotel's parking lot when a stranger approached the two wives. He asked whether the tall man was the famous illustrator. Assured his quarry would welcome a handshake, the stranger stepped forward while offering his open hand to Mr. Rockwell. The creator of Charlie Brown shook with the illustrator of The Four Freedoms, pressing together two of the great instruments of 20th-century illustration.